Utility Knife 4.5" Polyprop - Spyderco, Inc. Page 75 – Spyderco, Inc. The K05 Utility Knife has a 4.48-inch drop-point blade that offers an excellent balance of control and cutting performance. This makes it incredibly versatile and adaptable to many kitchen cutting chores and utility applications. Like the original version, it features a premium MBS-26 stainless steel blade, ground exceptionally thin and meticulously heat treated for optimal edge retention. Its durable polypropylene plastic handle is injection molded directly onto the tang of the blade and features a distinctive “stepped” texture pattern that provides amazing comfort and control during use. 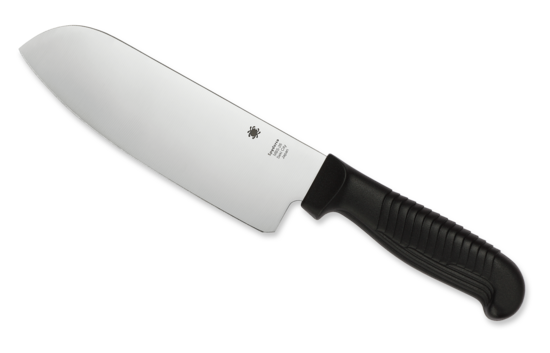 The K05 is available with a black handle and your choice of a PlainEdge or a SpyderEdge blade with a unique two-step serration pattern that protects the edge from dulling on cutting boards. The SpyderEdge version is also available with a red handle.